The Evinrude E-TEC 135 HO provides superior value and a real choice for power and performance in the 100-150 HP segment. Best-in-class features of the 135 HO include more low end torque via a 2-stroke design that allows the 135 HO to have up to 36 percent more torque than competitive 150 HP 4-strokes. In addition, the 2.6 litres of displacement from the V-6 engine means more torque, more low-end power and more top-end speed. Its lightweight design of 418 lbs. offers the best power-to-weight ratio in the industry and allows for better fuel efficiency, less draft, better handling and less stress on the boat structure. Other highlights include a true high output alternator, multi-point oiling and clean technology. With a factory-backed, 3-year non-declining warranty and 3 years or 300 hours with no dealer-scheduled maintenance, the Evinrude 135 H.O. is factory-tuned for high performance applications. It is available in four configurations 20" white, 20" blue, 25" white and 25" white counter rotation. 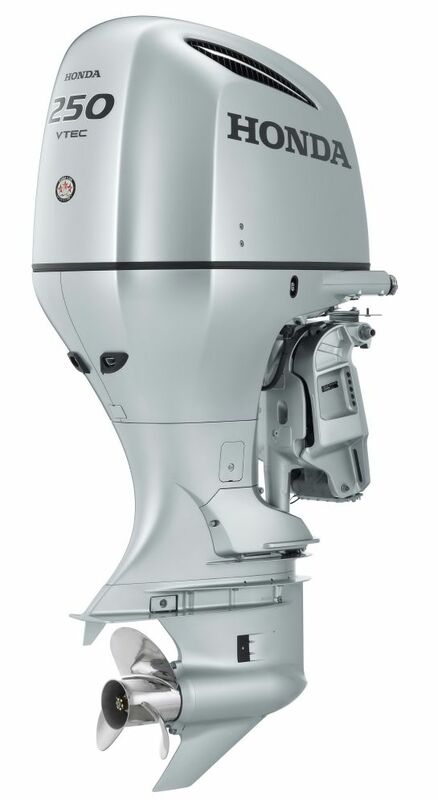 The Honda BF250 four-stroke engine is the newest and most powerful outboard to join the Honda Marine lineup and now the company's flagship model. The design of the BF250 incorporates a number of advanced technological innovations that contribute to the engine's high fuel economy and superior performance. The 3.6 liter VTEC® (Variable Valve Timing and Lift Electronic Control®) engine is equipped with an all-new gear case, incorporates the world's first marine direct air induction system of its type on a production outboard (providing for cooler, denser air for better combustion than conventional under-cowl induction systems), and has a full-throttle RPM range of 5300-6300. The Honda BF250 engine also incorporates the Boosted Low Speed Torque (BLAST™) System through which holeshot and acceleration are dramatically improved by advancing ignition spark timing to within one degree of the knock limit during ‘hammer down' acceleration.